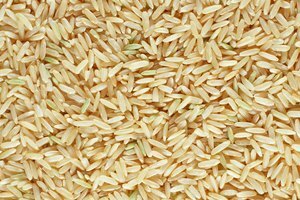 Wild, long-grain rice takes much longer to cook than white rice because it has a thick, outer layer that takes longer to soften. So, you can cook wild rice in a rice cooker, but use the brown rice setting, which runs from 30 minutes to 80 minutes, depending on the brand. Put 1 cup of wild, long-grain rice in a bowl. Add enough cold water to fully submerge the rice. Swirl the rice grains in the water gently. Drain the water by emptying the rice into a sieve. Wash the rice three more times. Place the rice back in the bowl and cover it with water. Let it soak for 30 minutes. Rinsing the rice cleans it of any surface impurities. 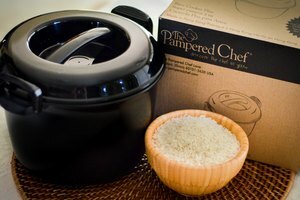 Soaking the rice also gives it a fluffier texture and softer consistency. 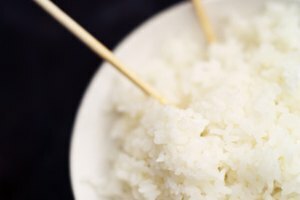 Place the rice in the nonstick container of the rice cooker. Add two cups of cold water. Cook on the "brown rice" setting. The complete cycle runs about 30 minutes. When the cycle is complete check to see if the rice is thoroughly cooked with a fluffy consistency. If not, allow the rice to heat in the "keep warm" setting for 30 minutes. This will remove residual water from the rice and allow it to soften. Stir the rice with a spoon to check its consistency. If the outer coating is crisp with a greyish tint then the rice is ready. 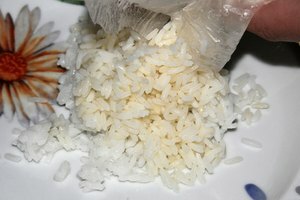 There can be residual water in the container after the rice is cooked. 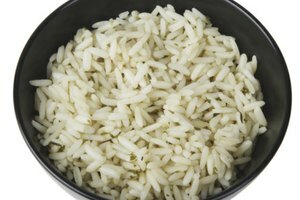 If there is excess water remaining drain it slowly off the rice by tipping the container at a 45 degree angle. Otherwise place it on the "keep warm" setting for another 30 minutes.